As a member of the Publications and Copyrights Committee of the AMBPPCT, I am putting before you the reasons I feel that there is a need for publishing authorised editions of Baba’s unpublished words in the present time. I use the word ‘authorised’ not in the egotistic sense. We are not authorised to authorise! Baba is the Author and will ever remain so. All we are trying to do with our limited human nature and intelligence is to keep the published product as close to the original as possible, while correcting grammar and spelling, and where possible filling in blanks. In that sense, we are working to preserve the authenticity and the accuracy of Baba’s words for posterity. We are creating a benchmark which will be what the AMBPPCT could call an “authorised edition”, as opposed to other free-lance interpretations of the same manuscripts. 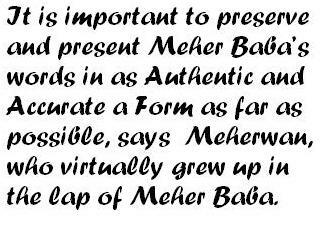 I have been with Meher Baba from the time I was born. Due to His Grace, I was fortunate to have lived for a time with Him as part of His men and women mandali, and also later, to have spent much time in His presence. I was given unique opportunities to observe how Baba Himself dealt with the issues and questions surrounding the publication of His words. He was very particular about the actual editing process, and in fact Baba had said, “Future editors will come who will be able to edit my works, because I want My words to be properly edited.” Even during His life He asked Don Stevens to re-edit The Discourses because the language had become archaic. After Baba dropped His body, the Trust took on the Olympian task of going through the many stores of documents and undertook the responsibility of putting His words before His lovers and the world at large as authentically and accurately as was possible. Many of His mandali devoted time and effort to this work – Mani S Irani, Rano Gayley, Adi K Irani, Feramroz Workingboxwalla, Eruch Jessawala, Bal Natu, Bhau Kalchuri among them – as did many of His Western and Eastern lovers who had been with Him and had knowledge of the events and circumstances surrounding some of the works. Among those are Ivy O’Duce, Elizabeth Patterson, Kitty Davy, Bill LePage, Darwin Shaw, Margaret Craske, Delia DeLeon, to name but a few. With the formation of the Archives Committee, all Baba’s writings and correspondence which was held by the Trust at the time was scanned, then safely stored. A lot of previously unpublished material was found, bringing forth works such as “In God’s Hand” and “Infinite Intelligence”. I was involved in the work of bringing the material found into a form and shape which, while being grammatically correct, was also readable by anyone who chose to read the books. Translations, interpretations of charts and diagrams, editing the words to make them read easily (some of the original sentences were abbreviated) was done over and over again because each of us who worked on the manuscript was aware of the enormous responsibility we held and didn’t want to publish a work that in any way distorted or made ambiguous Baba’s words. However, edit the manuscript we did. Because any editorial process is by its nature subjective and has to rely on the slant put on the work by the one doing the editing, there were several editors working simultaneously, to minimise this subjective interpretation. And to make it totally transparent, the original was scanned and put out on the Internet, so that anyone could read and cross-check to ensure that authenticity. At the present time we are working on editing The Tiffin Lectures. These are a series of informal talks given by Baba some time in 1925 to 1926. The manuscript we had was full of blanks and the source material was not available until recently, when Chanji’s diaries became available. Other sources too were found outside of the Trust Archives. E.g. Chris & Chris Pearson had a manuscript which had a lot of the blanks filled in, probably from Filis Fredrick (late editor of The Awakener). We are now working towards bringing all these sources together and putting forth a book that is worthy of our Beloved. 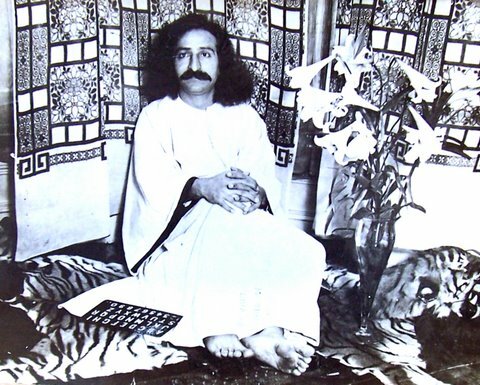 There is no perfection except with our Lord Meher Baba. We do not say that the “authorised edition” of His words will be so. It will be coloured with our limited understanding and our personal experiences, but it will be done with the heart and mind focused on Him, and with His guidance we will succeed. As more and more of the people who knew Baba in His physical advent die, it is necessary to have people who have made it their life work to study His works, and who have talked to and been guided by His close ones and those who lived their lives under Baba’s supervision. They in turn will pass on the knowledge they were given and their own additions to this, to those yet to come. Should we skip this meticulous and time-consuming process and just directly publish the manuscripts as is? It is only my opinion, but I do not feel that this is the way to go about publication. 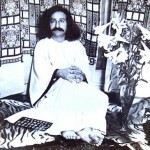 This entry was posted in Meher Baba Speaks, News and tagged Avatar, Avataric Legacy, Meher Baba, Meherabad. Bookmark the permalink.